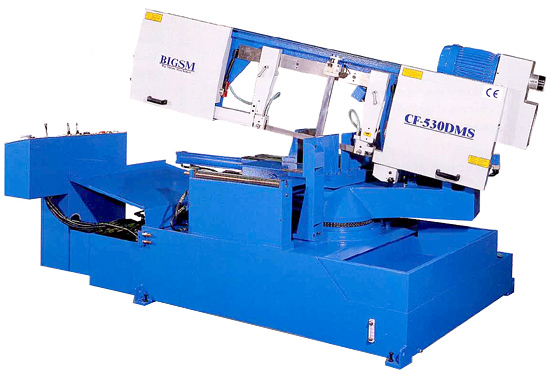 Semi-Auto Miter Cutting Band Saw (CF-530DMS) - Big Stone Machinery Co., Ltd.
(1) Variable blade speed drive. (2) Full stroke hydraulic vise. (4) HSS Saw blade 1 pc. (5) Tools with tool box. (2) 2 meters power roller table. 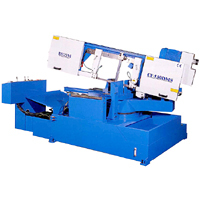 Unique mitre cutting design which allows mitre cuts to 60° left and 45° right by swivelling the head of the machine. Swiveling the head at any angle with digital readout to 0.1° accuracy and hydraulic swivel lock. Full stroke hydraulic vice clamping which saves the operator time and energy and increases blade life.